Concord Custom Canvas provides canvas and vinyl repair services in Knoxville, TN. We can repair pretty much any canvas or vinyl product you have that: Sunbrella, Naugahyde, TopGun, Harbor Time, etc. Rips, tears, gouges, etc in canvas: Generally we repair these by placing a patch over the damaged area. In some cases, we can use patch material that is identical to the original material. However, in many cases, we use a material that closely matches the original. Damaged thread: a very common cause of ripped canvas. We can restitch the original back together to restore it. We also commonly restitch the entire piece to prevent other thread from failing. Torn or Ripped Windows: We can also replace clear vinyl windows that are ripped, torn or are discolored from age. Cover too Short? 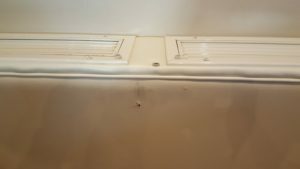 : We can make snap extensions to make that old cover fit where it should and you won’t have to replace it. 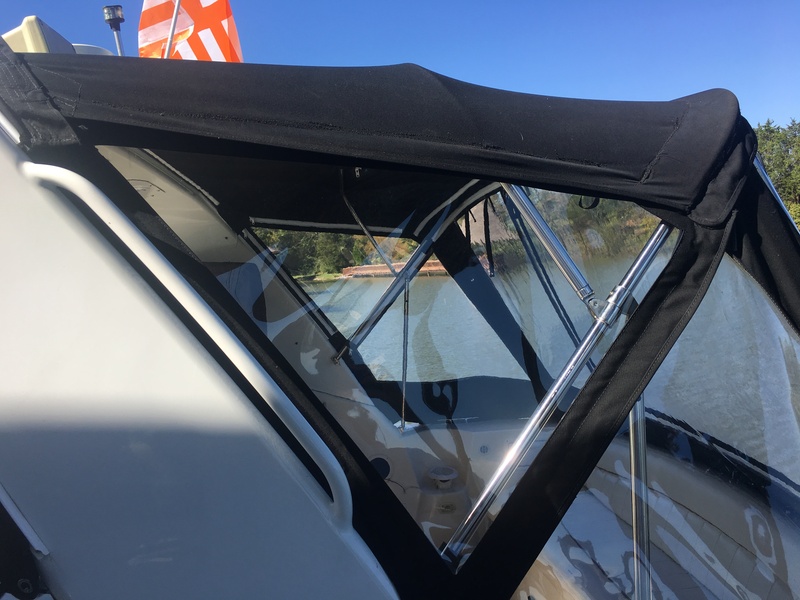 There are many types of vinyl to repair on boats: Fiber reinforced vinyl, clear vinyl (in windows) and fabric backed vinyl. 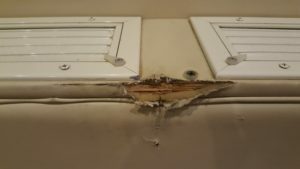 Each of these requires a different technique to repair. In some cases, we can even color match to the original piece. Please contact us if you have vinyl that needs to be repaired. 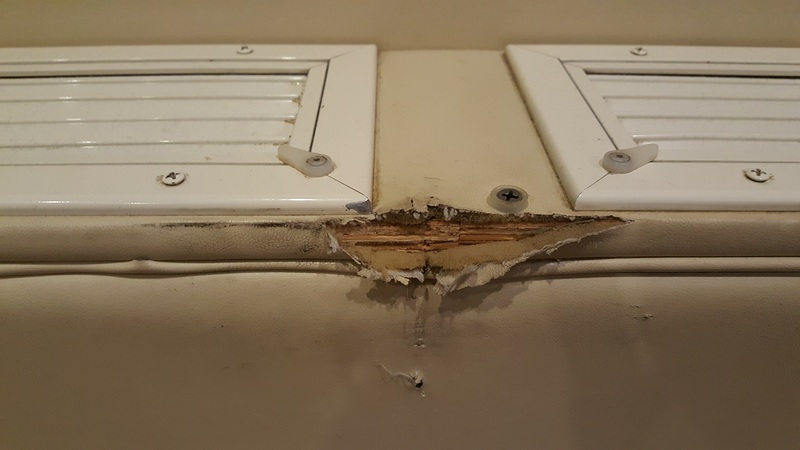 This an image of a air conditioner register on a power yacht before it was repaired. 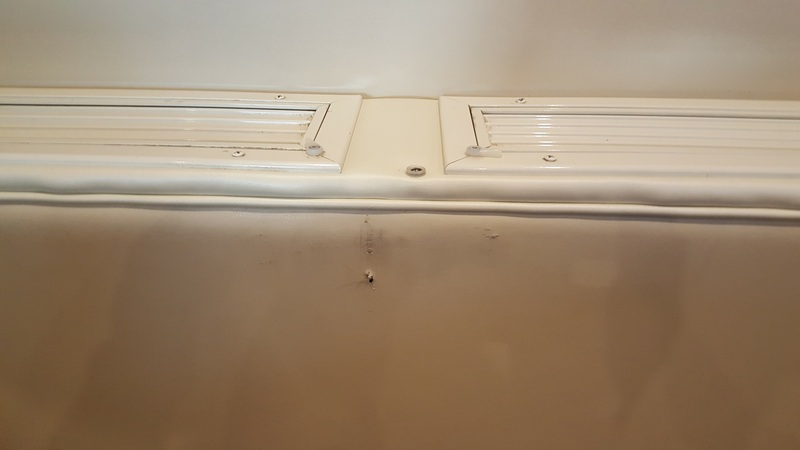 This is an image of the same air conditioner register after it was recovered with vinyl. We frequently get requests to replace the clear isinglass in canvas windows. Common reasons for this are that it is cracked or very wavy. We can usually replace it if the surrounding canvas is still good. Please contact us to discuss your canvas, window or cover rehab project.